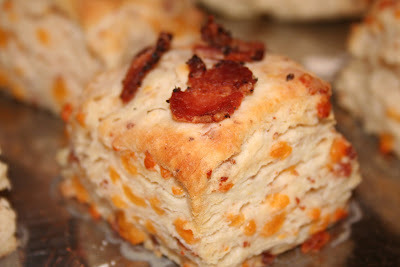 My friend Lisa got me started with adding savory ingredients to biscuit recipes. Thankyou friend! (These are cheddar cheese and pepper bacon!) It's a great way to fill out a menu with something that is different, hearty and can be made with things onhand (yes we always have bacon and cheese in the house...it's how I grew up.) Just take your normal biscuit recipe...either by scratch or a mix, and add your extras before you stir in the liquid. Green onion goes well, or ham bits, any kind of grated cheese of course, even sausage or browned ground beef. Another approach and one which I'd like to try is called Chop Block and can be found here . I've just never had the bread dough on hand. I'm thinking of trying it up at the cabin this summer since I tend to make bread dough more often up there. Anyway, just wanted to add a little more food to this blog! Hello, active blog!!!! Love the food posts. Very Pioneer Woman. (if you havent met her, look her up-you'll like it.) and LOVE Lily. Miss her so much. We are already talking about "when we live closer to Minnasota." As for the hyperlink. There is a button on the page where you write your post. it looks like a link. and that's exactly what it does. You highlight a word in your post and then click the link button, and type in the web address in the pop up box. clear as mud? love you and SO GLAD to see so much of the fam today! Suz, you were kind enough to give me credit on the recipe idea, but man-o-man, MY biscuits never look like this! You should go into recipe publishing -- you can do your own food photography! I just two new recipes I'm excited to try/adapt: baked rice and spinach and pan-fried gnocchi with broccoli and black beans! Mmmm. . .